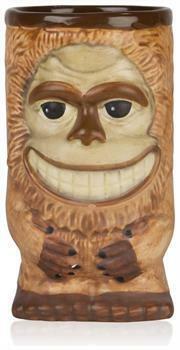 Give your tiki cocktails some mythical flair with the Bigfoot Ceramic Tiki Mug! This whimsical 19-ounce mug is perfect for a wide variety of classic tiki cocktails. It's made from ceramic that's been expertly crafted into the shape of everyone's favorite hairy humanoid. Tiki culture is all about having fun. So add some humor to your drinkware collection by ordering your Bigfoot Tiki Mug today! Not dishwasher safe. Hand wash only. Give your tiki cocktails some mythical flair with the Bigfoot Ceramic Tiki Mug! Holds 19 ounces of your favorite beverage. Mug is made from ceramic that's been expertly crafted into the shape of everyone's favorite hairy humanoid. Tiki culture is all about having fun. So add some humor to your drinkware collection by ordering your Bigfoot Tiki Mug today!